薛秀娟, 闫江舟, 程栋, 刘春华, 刘佳, 刘铮, 田随安, 孙定勇, 张伯伟, 王哲. Xue Xiujuan, Yan Jiangzhou, Cheng Dong, Liu Chunhua, Liu Jia, Liu Zheng, Tian Sui'an, Sun Dingyong, Zhang Bowei, Wang Zhe. Xue Xiujuan, Yan Jiangzhou, Cheng Dong, Liu Chunhua, Liu Jia, Liu Zheng, Tian Sui'an, Sun Dingyong, Zhang Bowei, Wang Zhe. 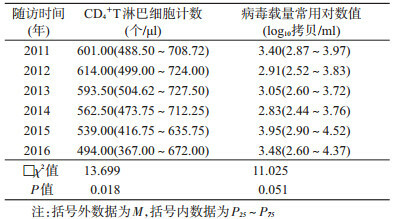 Human leukocyte antigen polymorphism of HIV infected persons without disease progress for long-term in Henan province, 2011-2016[J]. Chinese Journal of Epidemiology, 2019, 40(1): 89-92. Abstract: Objective To understand the disease progression and human leukocyte antigen (HLA) gene polymorphism of HIV-infected persons without disease progress for long term, also known as long-term non-progressors (LTNPs), in Henan province. Methods A retrospective study was conducted in 48 LTNPs with complete detection and follow-up information during 2011-2016 in Henan. Changes of CD4+T cells counts (CD4) and viral load (VL) during follow-up period were discussed. Polymerase chain reaction-sequence-specific oligonucleotide probe (PCR-SSOP) was used for the analyses of HLA-A, HLA-B and HLA-DRB1 alleles between LTNPs and healthy controls. Results From 2011 to 2016, forty-eight LTNPs showed a decrease of the quartile (P25-P75) of CD4 from 601.00 (488.50-708.72)/μl to 494.00 (367.00-672.00)/μl, and the difference was significant (P < 0.05). The increase of the quartile (P25-P75) of log10VL from 3.40 (2.87-3.97) to 3.48 (2.60-4.37), but the difference was not significant (P>0.05). HLA polymorphism analysis revealed that HLA-B*13:02 and HLA-B*40:06 were more common in LTNPs (P < 0.05), while HLA-B*46:01 and HLA-DRB1*09:01 were more common in healthy controls (P < 0.05). 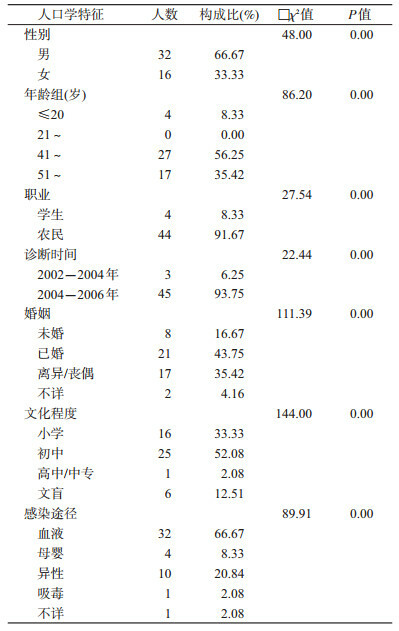 Conclusions The CD4 of LTNPs in Henan showed a downward trend year by year. HLA-B*13:02 and B*40:06 might be associated with delayed disease progression for HIV infected persons in Henan. 刘佳, 樊盼英, 薛秀娟, 等. 河南省HIV感染长期不进展者及病毒控制者病例特征分析[J]. 中华流行病学杂志, 2016, 37(2): 227-231. 薛秀娟, 孙国清, 刘春华, 等. 河南省HIV感染长期不进展者随访研究[J]. 中华预防医学杂志, 2014, 48(8): 684-687. 薛秀娟, 田随安, 朱谦, 等. 河南省26例HIV感染长期不进展者病程进展及耐药情况[J]. 中华预防医学杂志, 2016, 50(2): 143-147. 薛秀娟, 刘佳, 田随安, 等. 河南省HIV新报告感染者和长期感染者的病程进展调查[J]. 现代预防医学, 2015, 42(8): 1495-1497. Xue XJ, Liu J, Tian SA, et al. Research of HIV progression between newly reported and chronically infected patients in Henan[J]. Mod Prev Med, 2015, 42(8): 1495-1497. 许铭炎, 马军, 洪坤学, 等. 中国新疆维族人群HLA-B等位基因与HIV-1感染易感性或抗性[J]. 中国病毒学, 2005, 20(6): 594-599. Xu MY, Ma J, Hong KX, et al. HLA-B alleles associated with susceptibility or resistance to human immunodeficiency virus type 1 in a Xinjiang Uygur Population, China[J]. Virol Sin, 2005, 20(6): 594-599.